A total of 50 programs received Summit, Gold and Silver honors. 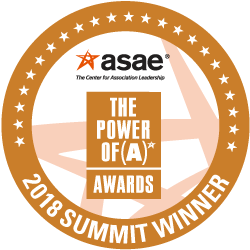 ASAE’s Power of A Awards highlight the association community’s valuable contributions to society on the local, national and global level. They honor the outstanding accomplishments of associations and industry professionals in the areas of strengthening lives, forging a more trained and highly competitive workforce, enhancing the economy, driving innovation and making a better world. We are thankful to all who entered this year’s competition, and congratulate all the winners.